The new Gozo harbour terminal was inaugurated by the Prime Minister this morning at Mgarr, making it possible for passengers to embark and disembark from the ferries separately from the cars. Dr Gonzi described the event as a major leap of quality for passengers travelling between the two islands. The €9.7 million project has been several years in the making, with plans having been revised to make the structure more in keeping with the characteristics of Mgarr. The terminal can cater for 600 passengers and 200 cars at a given time. It includes a cafeteria, luggage handling facilities and a 180 slot underground car park, as well as a new marshalling area. A similar terminal will be built at Cirkewwa once EU funds are confirmed, Transport Minister Censu Galea said. Investment and IT Minister Austin Gatt, who is responsible for the Gozo Channel line, said the terminal would mean more convenience for passengers. He said that while a record number of passengers had used the ferries last year, there was already an 11 percent increase in traffic in the first six weeks of this year compared to the same period last year. Gozo Minister Giovanna Debono said this was another link in a series of infrastructural projects in Gozo. 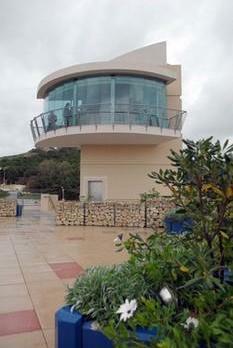 Other projects included the nearby Zewwieqa promenade and the rebuilt road from Mgarr. The new terminal, similar in some respects to the air terminal, is also meant to cater for cruise passengers.